Here comes Hollywood…. Supprised? Nope. Hollywood Director “SIR?” Peter Robert Jackson now on site. 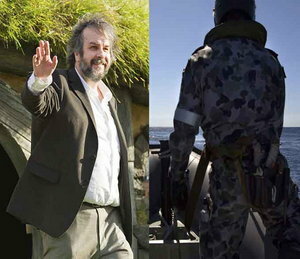 The personal jet of Peter Jackson – Oscar-winning New Zealand movie director – is also being used in the hunt. Up to 10 planes and nine ships will assist in today’s search for the Boeing 777-200, a new Joint Agency Co-ordination Centre (JACC) here managing the search said in a statement today. For the uninitiated, Sir Peter Robert Jackson is a New Zealand film director, producer and screenwriter. He is best known as the director and producer of The Lord of the Rings trilogy (2001–2003) and its prequel The Hobbit trilogy (2012–2014), which are adapted from the novels of the same name by J. R. R. Tolkien. Other notable films include Heavenly Creatures (1994), Forgotten Silver (1995), The Frighteners (1996), King Kong (2005) and The Lovely Bones (2009). He also produced District 9 (2009), The Adventures of Tintin (2011) and the documentary West of Memphis (2012). That makes three “ROYALS” at the site now. Posted on April 2, 2014, in Book of Revelation, Illuminati, Malaysian Flight 370, New World Order, Sorcery, spiritual warfare, What's Urgent? and tagged Director Peter Jackson at MH370 site, Hollywood director on site at Indian Ocean MH370 elusive "CRASH" site.. Bookmark the permalink. Comments Off on Here comes Hollywood…. Supprised? Nope. Hollywood Director “SIR?” Peter Robert Jackson now on site..